Get Up To 25% Off The Nike Free RN Distance 2 + Free Shipping. Select Nike styles and other exclusions apply. Clearance Sale! Get up to 49% off over 1060 best selling shoes, apparel & gear. Select Nike styles and other exclusions apply. Get $150 off Select Garmin Monitors + Free Shipping. Select Nike styles and other exclusions apply. Save $20 on Everything + Free Shipping. Select Nike styles and other exclusions apply. Get Up To 23% Off Training Shoes From Your Favorite Brands + Free Shipping. Select Nike styles and other exclusions apply. Green Monday Gift Time! Get Green Monday Gift Time! 25% Off Everything When You Join the VIP Family. Select Nike styles and other exclusions apply. Countdown to Christmas Sale! Save 15% Site Wide + Free Shipping! Use offer code SANTA18 at checkout! Some exclusions apply, see site for details. Get Free Standard Shipping for VIPs. Select Nike styles and other exclusions apply. Green Monday Sale! Save 15% Sitewide + Free Shipping at checkout , see site for details. Select Nike styles and other exclusions apply. Get 50% Off Nike running Shoes & Gear. Select Nike styles and other exclusions apply. Here’s A Gift To Getcha Movin! Get 20% Off all Shoes for VIP members. Select Nike styles and other exclusions apply. 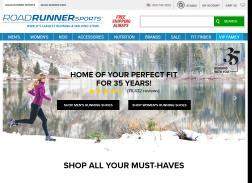 Get 10% Off Running Shoes, Fitness Apparel And More With Sign Up Plus Free Shipping. Select Nike styles and other exclusions apply. Get Up to 22% off New Balance Fresh Foam 1080v7 + Free Shipping. Select Nike styles and other exclusions apply. Countdown to Christmas Sale! Get 25% Off Sitewide when you Sign Up + Free Shipping. Select Nike styles and other exclusions apply. See site for details. Get $35 Off $150+ or $20 Off $100+ Sitewide + Free Shipping on Select Nike styles. Other exclusions apply. Get up to 49% Off Clearance + Free Shipping on all orders. Select Nike styles and other exclusions apply. Shop Deals Under $30. Select Nike styles and other exclusions apply. Get free Standard Shipping on all orders. Select Nike styles and other exclusions apply. Get Free Shipping on any order. Select Nike styles and other exclusions apply. Get 20.19% off shoes, apparel and gear when You Join VIP Family. Select Nike styles and other exclusions apply. New Customers! Save 25% on your first order + Free Shipping. Select Nike styles and other exclusions apply. You Most Loved Tights & Pants Event! Get 20% off R-Gear Tights & Pants. Select Nike styles and other exclusions apply. Get 20% off Sitewide. Select Nike styles and other exclusions apply. Give’em a Boost – Bra Event! Get 25% Off Select Best-Selling Sports Bras! Select Nike styles and other exclusions apply. Get $100 off The Fenix 5 and 5 Plus Series Gramin Watches. Select Nike styles and other exclusions apply. Get 10% Off Sitewide for VIP members. Select Nike styles and other exclusions apply. Huge Summer Steals! Get Up to 25% Off Best Selling R-Gear Apparel. Select Nike styles and other exclusions apply. Get Up To 49% Off Clearance Items Plus Free Shipping. Select Nike styles and other exclusions apply. Get up to 47% Off R-Gear Apparel Line. Select Nike styles and other exclusions apply.